Camera Error When Wearing Rigged Mesh Avatar? Nevermind. I tried again only this tiem I didn't check "Include joint positions" and it works fine now. Figured I'd leave this posted, incase anyone else has the same problem. I just created my first rigged mesh avatar. Or so I thought. When I wear it, it forces my view up to the sky. When I take it off, my view stays up in the sky. I have to relog to get my view back to normal. Any ideas on what is causing this? 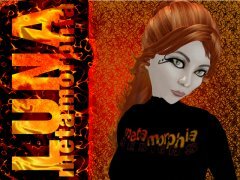 I created it in Maya 2011 (I used Reed Steamroller's skeleton and the Collada exporter). Thanks in advance! Thanks! That's the problem then, except for the dress. I just had done the dress as a test, so it doesn't matter. I'll have to redesign my AV models (unfortunately), since they aren't proportioned correctly to fit the skeleton. If anything goes wonky, I'll check and see if I skipped a step, or assume it's my internet and try again. Thanks again! I'm not clicking the joints button. They are as tall as my AV (about 2 meters) when rezzed on the ground. It must be something that is happening if I change the skeleton to match the model because it didn't happen to the extruded cube AV one I tried most recently (that one worked fine, but was really basic like gumby). But then again, I didn't change the skeleton on the dress and it did happen to that one. Sorry, I think I'm repeating myself. The dresses rig must not have exported properly, I guess . . . or it's my crappy internet connection (wireless hotspot in the woods) and I need to be patient. It did take it quite awhile to rezz on the ground. But it definitely isn't working if I try to match the skeleton to my existing models. Anyway, thanks for the help! I'm certainly a lot further along than I was! Is it not possible to adjust the joint position of the skeleton and still have it work? LOL Well, once again, that fixed one problem but created another! If I use any of the meshes I mentioned earlier, they rezz fine on the ground, but if I attach them, they go invisible . . . but this time my avatar is still visible. I did create a new mesh around the skeleton and that works fine. The odd thing is that I had built the dress around the skeleton and that goes invisible, as well. I'm really confused. So once again, if anyone has any clue of what I need to do, or not do, please help! I remember seeing someone else having a similar problem, while I was looking for the answer to the other problem. Unfortunately, I can't find the post again. Yay! Thank you Pennelope and Streetz! This has been driving me nuts too! But now I have a new problem! LOL When I attach my meshes to my pelvis, my view goes up to the sky. When I back up my view, I am entirely invisible. I detach the mesh, and am still invisible. I have to quit SL and relog. I've had this problem with 3 different types of AVs that I made (even a simple block figure) and also with a very basic tube dress. What am I doing wrong? Or not doing? I'm not having the problem elvis was having, but my upload button disappears even though I have unchecked "remove unused influences"﻿. Any ideas? Thanks! I tried all that with no luck on the MacBook. I was fianlly able to get it work on the desktop. I renamed all my old SL folders and did a clean install. I did this on both machines. It help with the desktop, but not with the MacBook. Very odd. I logged into Aditi to upload a model I want to test, but Model isn't available in the Build menu. Any ideas on why? (Yes, I'm using the most current Viewer, which I finally got to work on our desktop, but not on my laptop . . . and I took the quiz and can upload models in Agni). Edit: Model is now available in the Build menu, but I'm getting a warning that I need to take the quiz before I can upload (as I mentioned, I've taken it). This would be AWESOME news! Except I can't log in with any viewers other than V1 based ones and Firestorm. I get a DNS failure error message and none of the posts in Answers are working for me. I've got my fingers crossed that 3.0 will work (eventhough the BETA version did not), but I'm not holding my breath. Can anyone help me with this issue? I've got mesh products that I'm excited to start selling. I'm having this same problem, only none of the solutions are working for me. I've tried the DNS numbers and they don't work. The Mesh Project Viewer isn't working for me. I even tried the current BETA version. I can't log into any of these, wihtout getting the DNS error. I tried 2.2 and that just says I must upgrade to 2.8. ﻿I even tried the old Mesh Project Viewer, but it also says I must upgrade. I can log in using the original official SL viewer, Phoenix, and surprisingly with Firestorm. Unfortunately, this doesn't help me much. I build models in Maya and want to get ready to bring them into SL as Meshes. But none of the current Mesh enabled viewers are working for me. I even tried on both of my systems: Leopard and Snow Leopard. Can anyone give me some ideas as to how I can fix this? Or is there any hope that this apparent bug will be fixed realitively soon? Thanks! edit: I've got it working on the Snow Leopard System finally (a desktop), but I still can't login using the Leopard Macbook. How do I create proper Mesh LOD for SL upload (using Maya)?﻿ Thanks! I can't login with the Mesh Project Viewer (to either the Main Grid or Aditi). I get the message: Login Failed. DNS cannot resolve the hostname. (I am able to login with other viewers.) Any ideas? (I'm on a MacBook, if that matters).